A leading, private, non-profit substance abuse and mental health treatment provider headquartered in the northeast United States was opening a state-of-the-art facility in Massachusetts in order to more fully meet the considerable demand for addiction treatment in the New England market. The market they were entering is highly competitive and they had no existing brand or industry recognition. 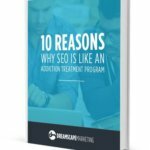 An exclusive, drug and alcohol addiction treatment center based in Florida with a strong sales team and industry reputation was looking to diversify away from its focus of generating on-line leads through pay-per-click (PPC) advertising and build equity value in their digital operations to lower overall cost per admission. A de novo drug and alcohol addiction treatment facility based in southeast Florida was opening in the fall of 2015. Its mission was to provide outstanding and lasting solutions that inspire and enrich the lives of those they encounter. One of the many ways they did this was by offering multiple levels of care and various types of care including Acceptance and Commitment Therapy, Cognitive Behavioral Therapy, Family Work, Trauma-informed therapies (EMDR & Hypnotism) and Relapse Prevention Strategies. Each with a focus on personalized treatment plans for the individual.